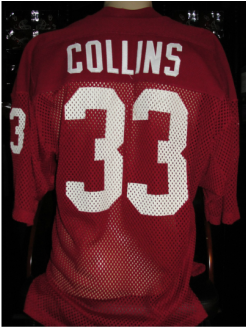 In 1984, Tony Casillas was named Consensus 1st Team All-American and 1st Team All-Conference. 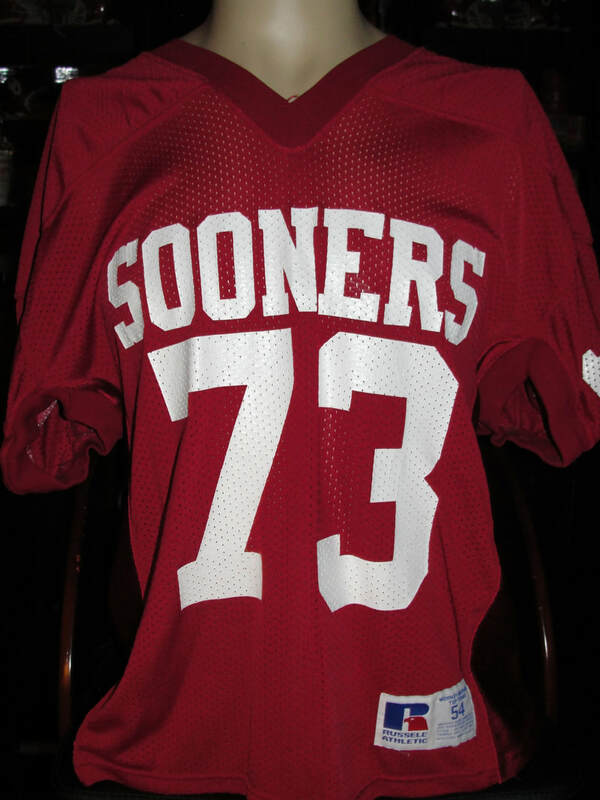 In 1985, he became only the second Sooner ever to win the Lombardi Award, which is given to the nation’s top lineman. 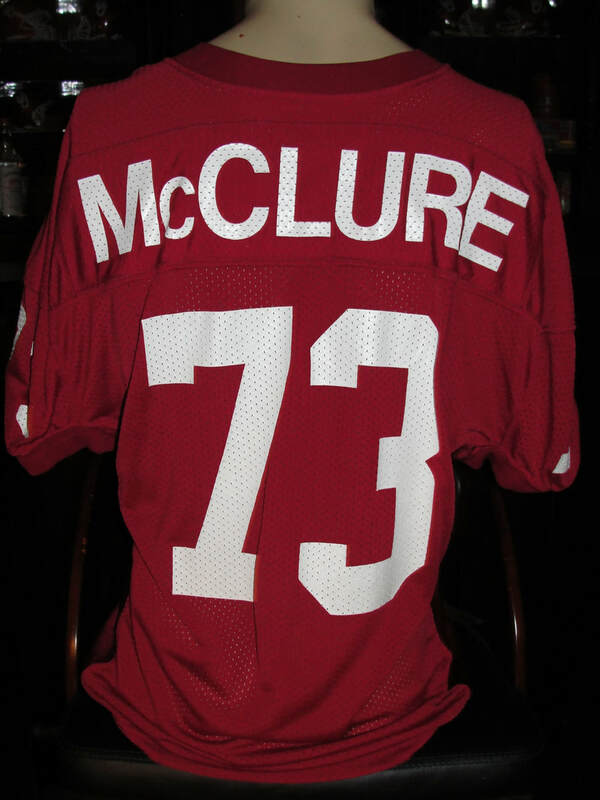 He was named the UPI Lineman of the Year, the Big 8 Conference Defensive Player of the Year, a Consensus 1st Team All-American and 1st Team All-Conference. 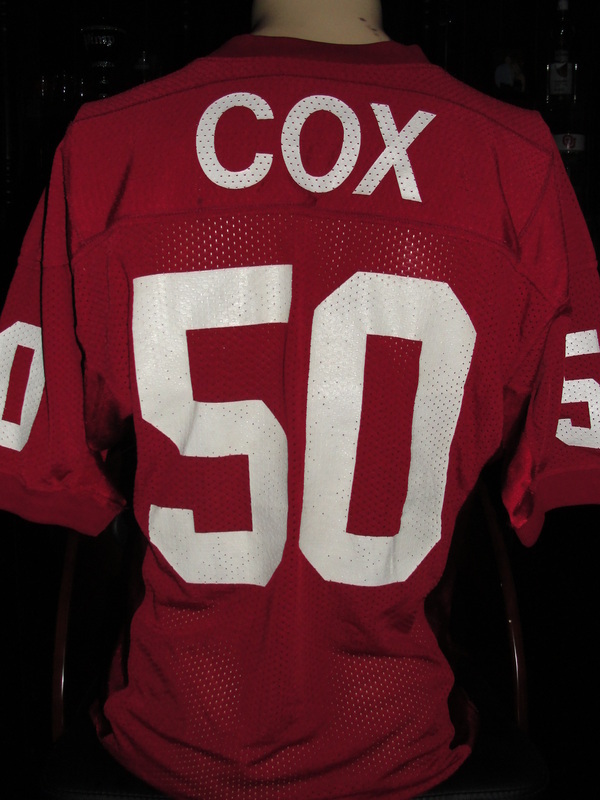 He ended his college career with 18 sacks and 213 career tackles in addition to graduating with Academic All-American Honors in 1985. 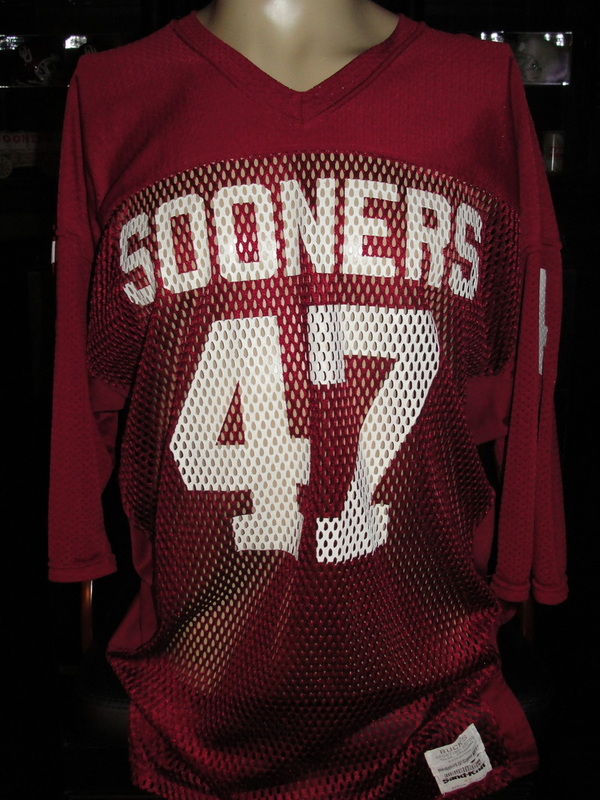 In 2004, Casillas became the second Hispanic (his father is Mexican and his mother comes from Irish and Native American descent) to be inducted into the College Football Hall of Fame. 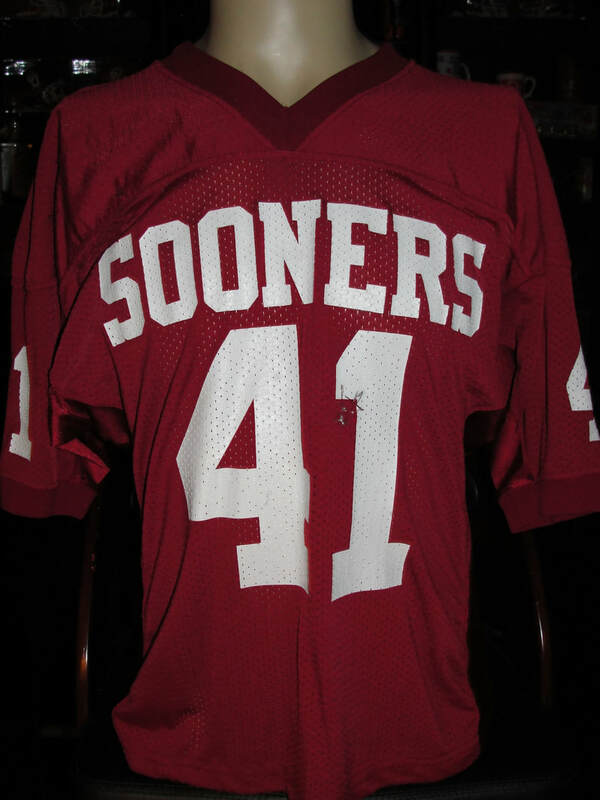 The National Football Foundation named Casillas the College Defensive Player of the Decade for the 1980s. 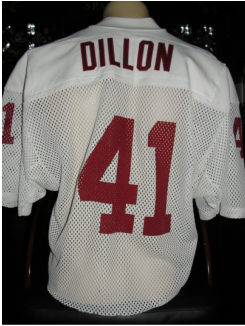 In 2008, he was inducted into the Oklahoma Sports Hall of Fame. 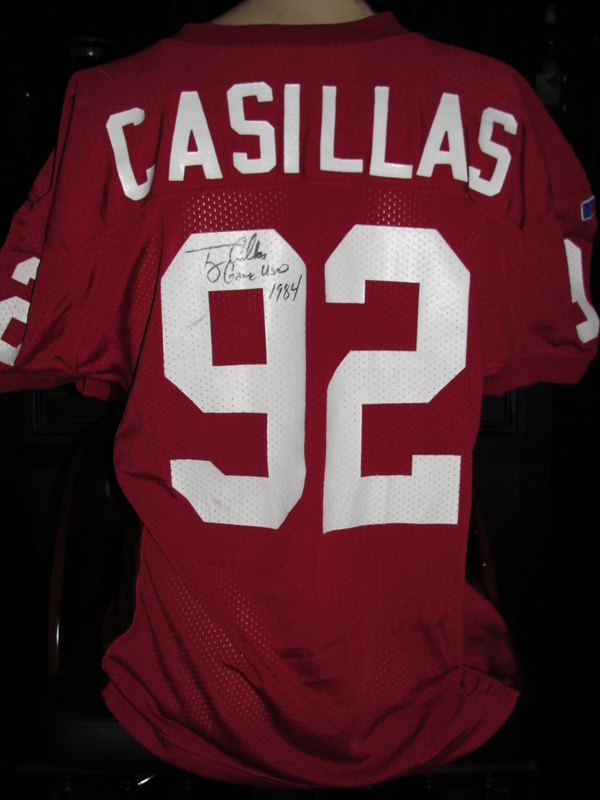 Mr. Casillas autographed and inscribed this 1984 Game Used Jersey. 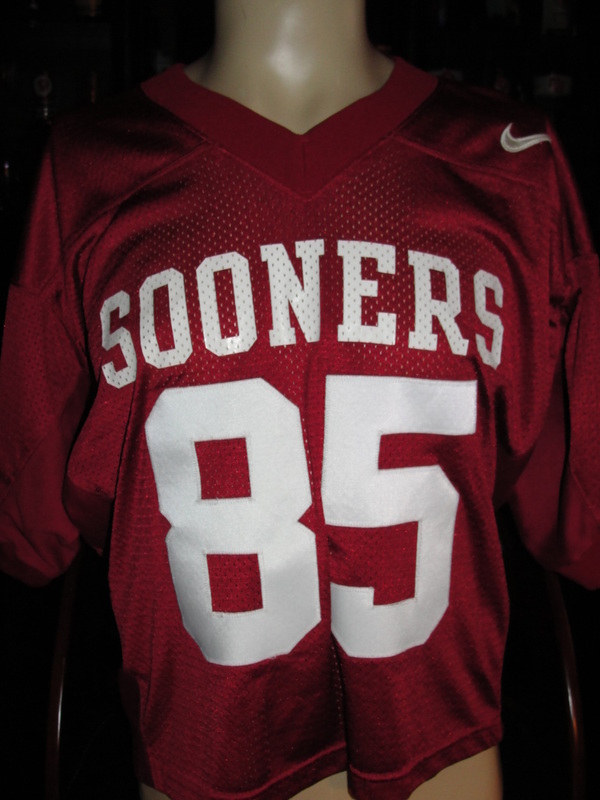 The jersey shows numerous hit marks and game use throughout. 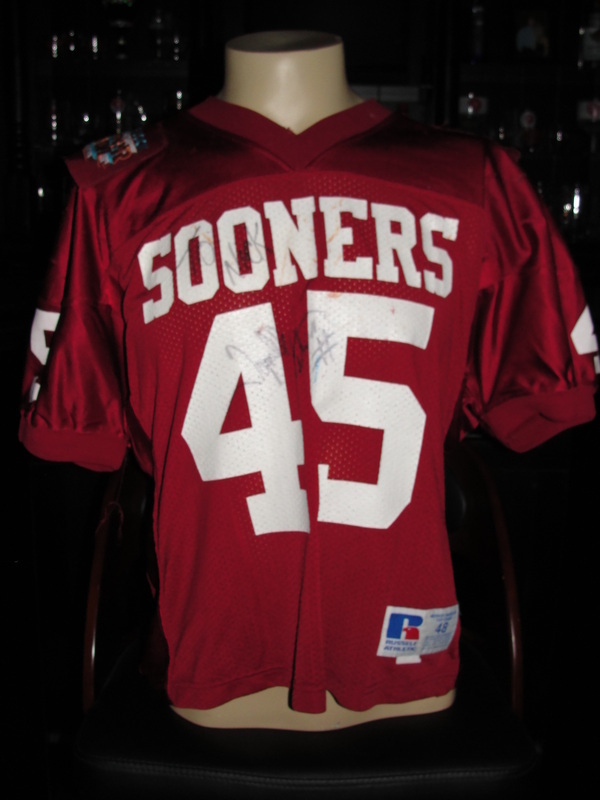 The jersey is properly tagged with Russell Athletic tagging which was consistent with what Oklahoma wore during his playing career. 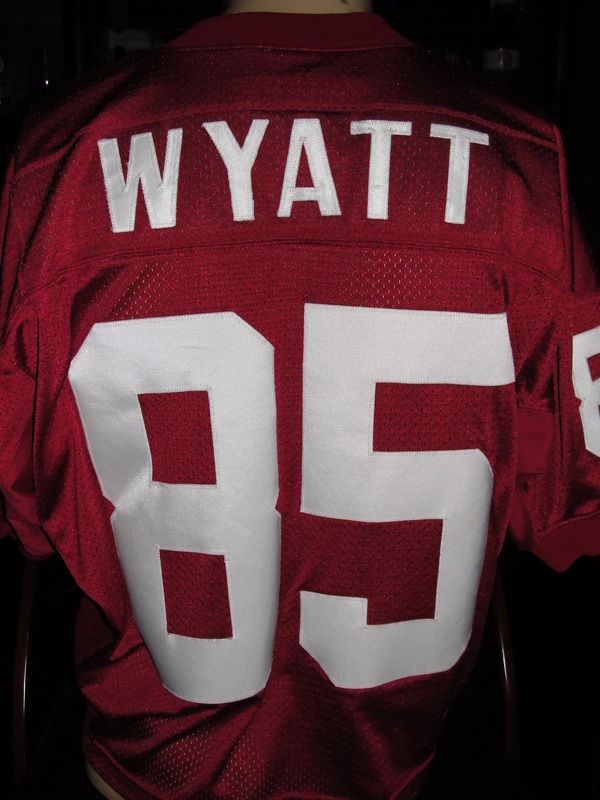 Overall, a great game used jersey of one of the All-Time Sooner Greats. 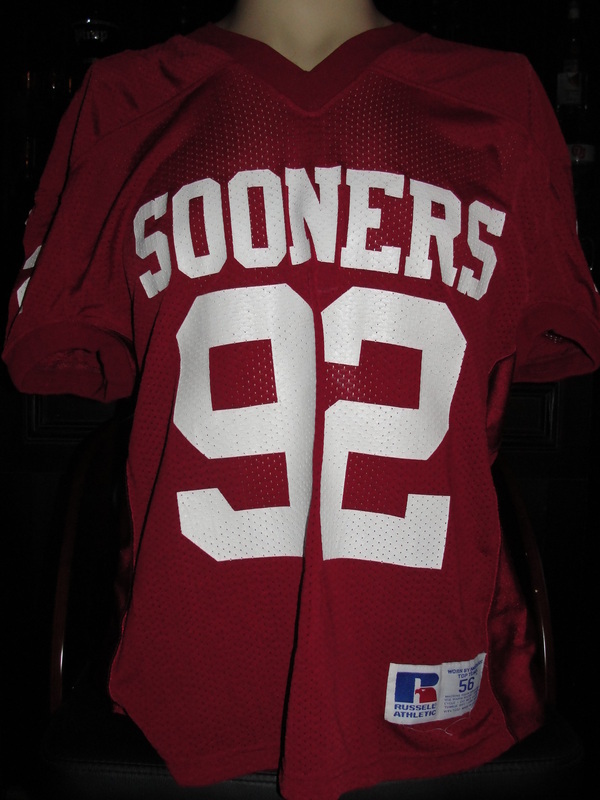 Darrell Kirby played in Norman from 1986 through 1990. 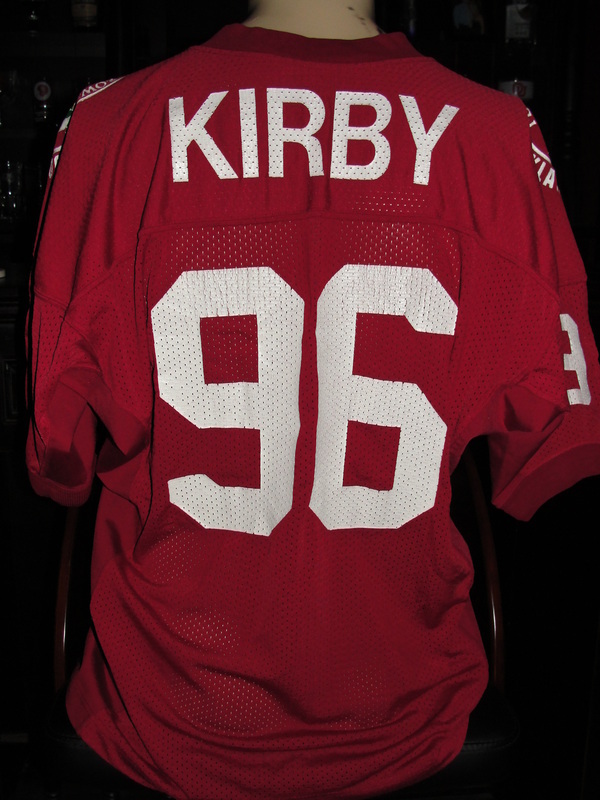 This jersey was worn by Kirby after the 1988 season (January 2nd, 1989) in the Citrus Bowl, losing the game 13-6 to the Clemson Tigers. 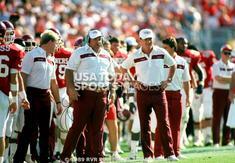 This would also end up being the last game Oklahoma Coaching Legend Barry Switzer would be on the sidelines. 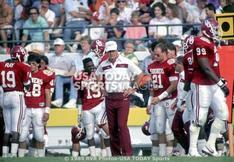 Switzer became head coach at Oklahoma in 1973, leading the team to undefeated seasons that year and the next. 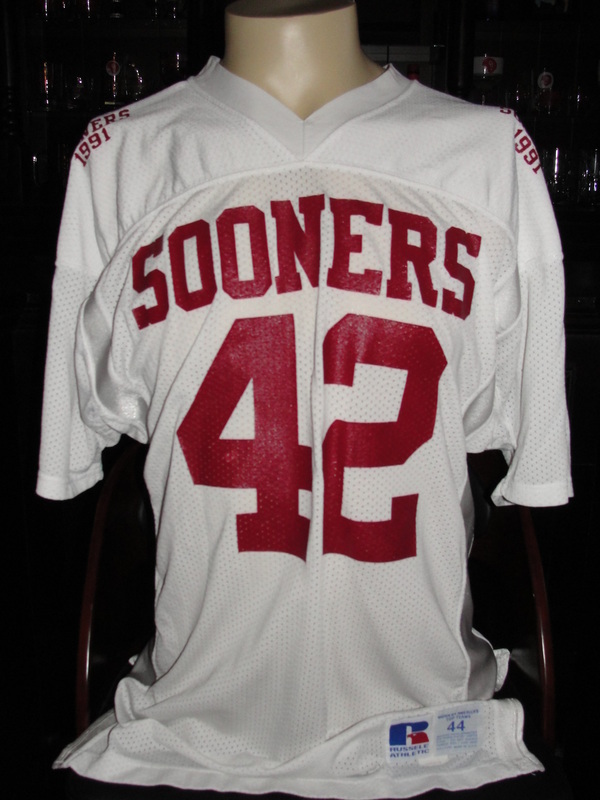 Oklahoma won the National Championship in 1974, 1975 and 1985 under Switzer's leadership. The team won or shared the Big Eight Conference Championship every year from 1973 to 1980. 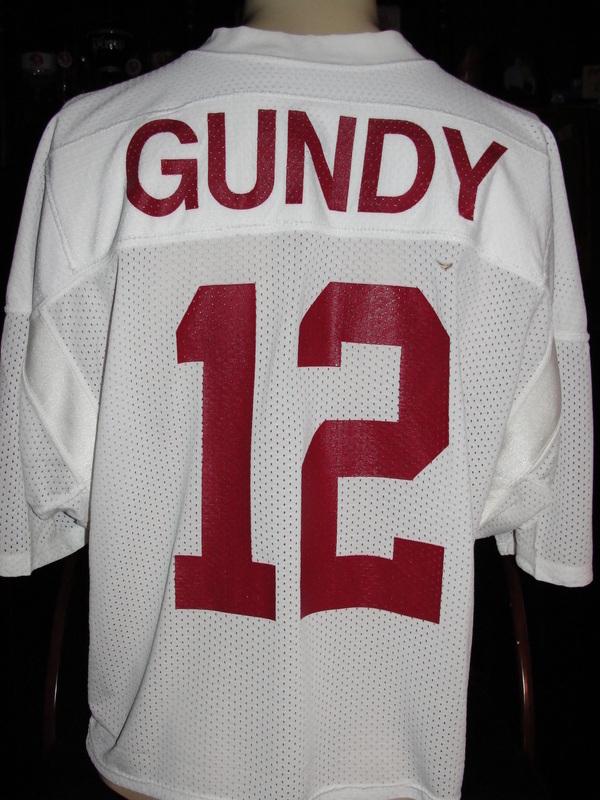 Cale Gundy held virtually all of OU’s single-game, single-season and career passing records prior to the air-raid offense with the arrivals of Josh Heupel, Jason White, Sam Bradford and Landry Jones under head coach Bob Stoops. 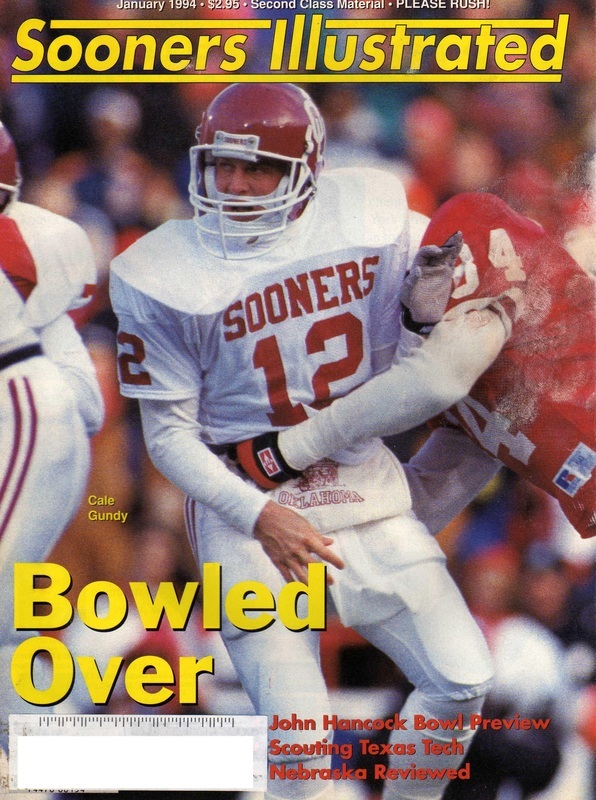 Gundy paced the Sooners to a 31-13-2 record in his four seasons, earning All-Big Eight First Team honors as a senior. 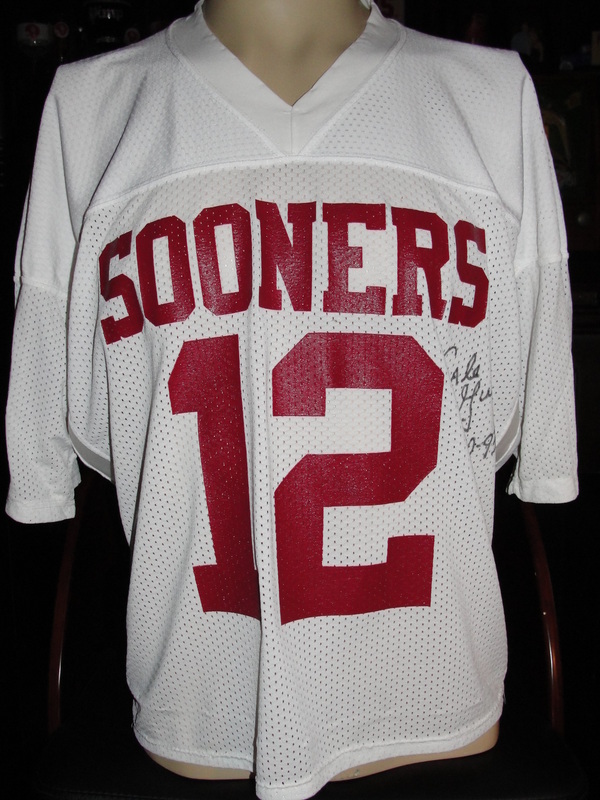 One of only five OU quarterbacks to throw for more than 4,000 yards (Landry Jones, Bradford, Heupel, White). 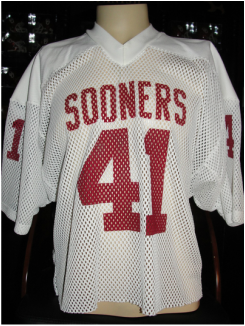 Gundy was Big Eight Offensive Newcomer of the Year in 1990 with marks for completions (54), attempts (109) and yards (904). 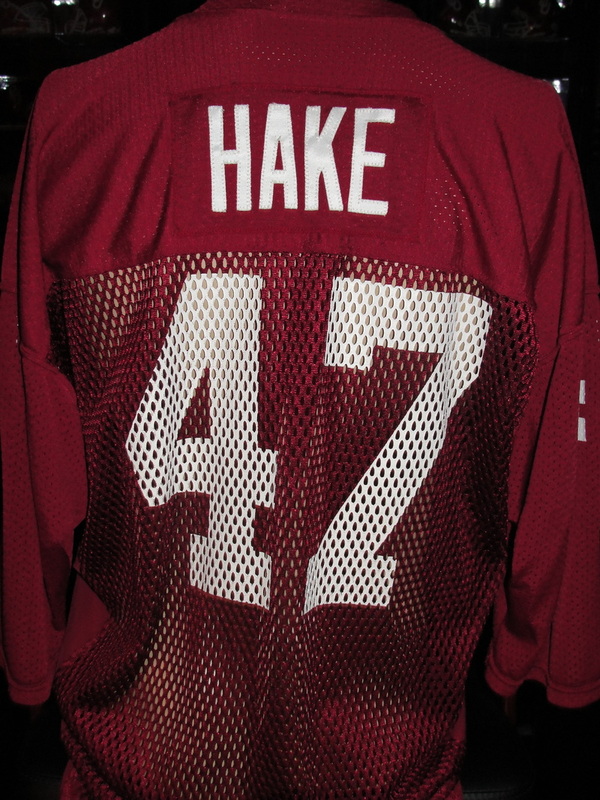 The Denver Broncos selected Johnson in the fourth round of the 1996 Draft. 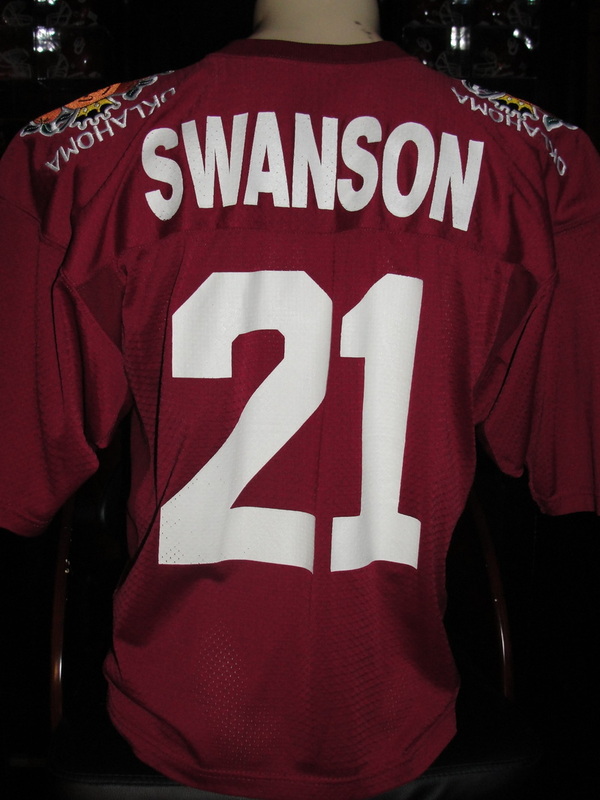 Johnson played in 61 games for the Broncos from 1996 to 1999, during which he had two interceptions, both in 1998. 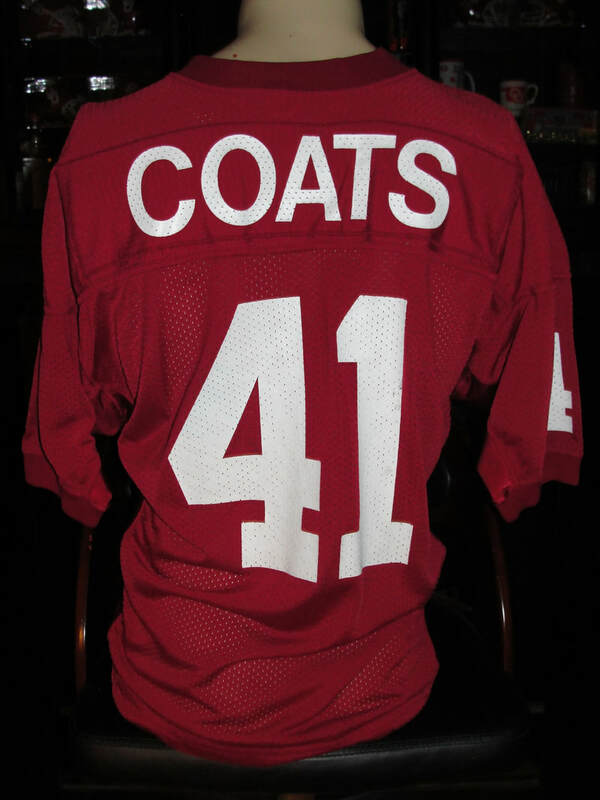 One of his biggest games was a 1999 Playoff Game against the Miami Dolphins, where Johnson had a 44 yard interception return and caused a fumble which was returned for a touchdown. 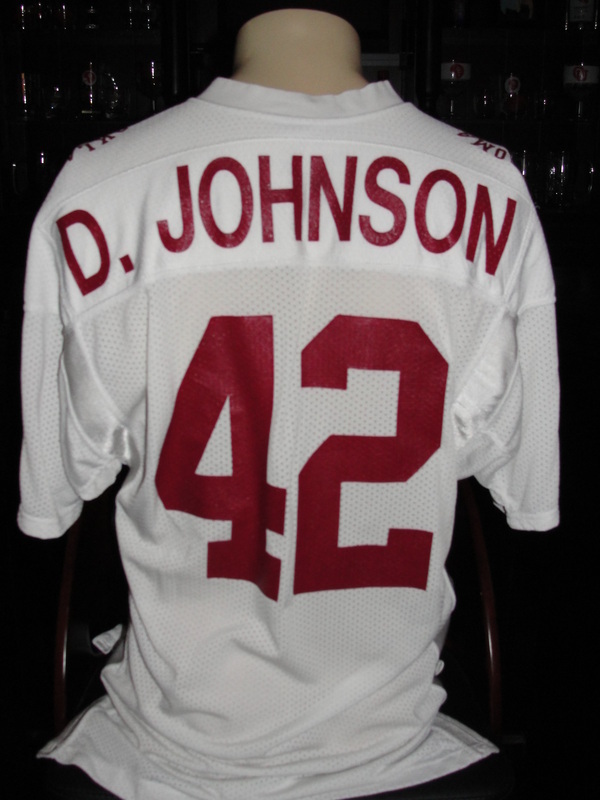 Johnson was a member of the Broncos Super Bowl XXXII and Super Bowl XXXIII Championship squads. Johnson played briefly for the Kansas City Chiefs in 2003. 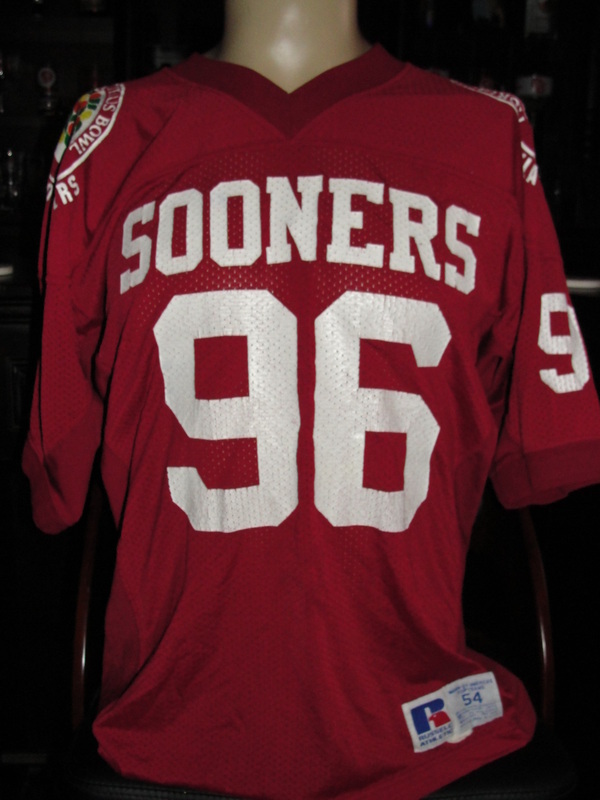 This 1991 Gator Bowl jersey was worn by Mr. Johnson during his freshman campaign at Oklahoma. 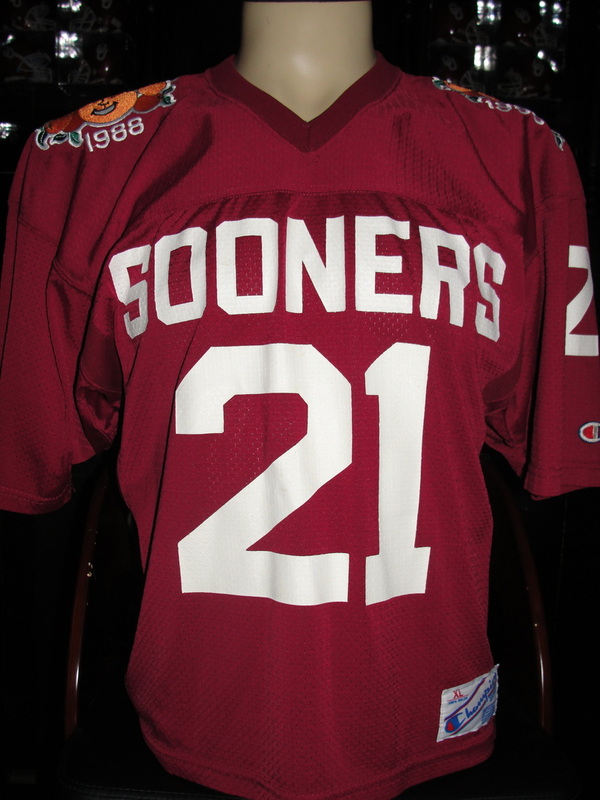 The Russell Athletic tagging is consistent with this time period at Oklahoma. 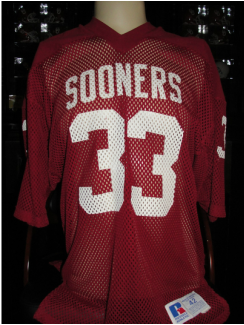 Being that 1991 was Darrius Johnson's freshman year (in which he redshirted) the jersey doesn't show any significant amount of wear or game play. 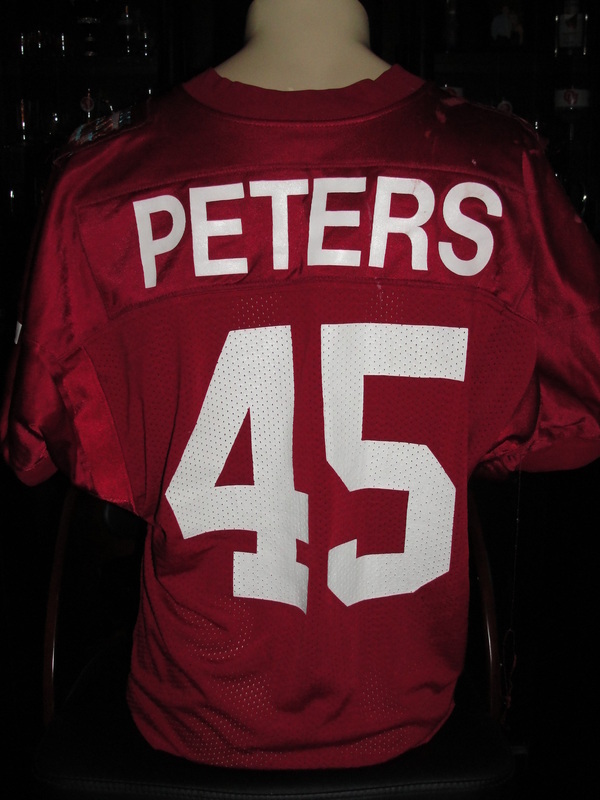 This Tyrell Peters (1994 Copper Bowl Jersey) shows tremendous game use throughout the jersey. 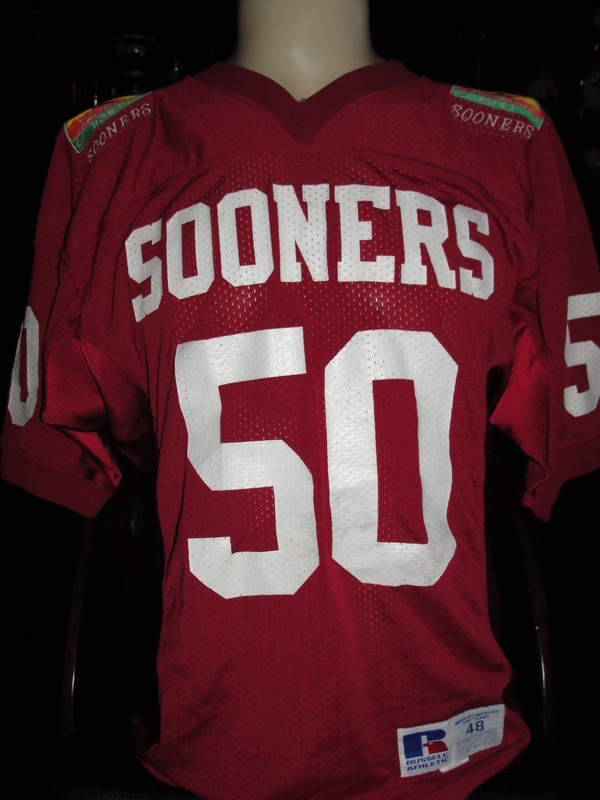 Consistent with the type of play at Linebacker one would expect, the jersey is hammered with hit marks, scuffs and repairs.